Angharad was awarded a BSc (Hons) in Optometry from Cardiff University in 2013 and qualified as a Member of the College of Optometrists in 2014. 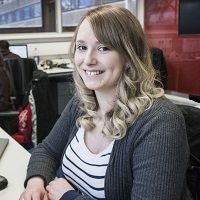 She joined City, University of London as part of the David Crabb Lab in the autumn of 2014 and is currently working towards her PhD. Her research looks at the functional and structural assessment of retinal disease through ocular electrophysiology and optical coherence tomography. Angharad practices part time at Eastbourne District General Hospital where she specialises in Low Vision. She also works as a locum optometrist and is a member of the educational faculty at The Johnson and Johnson Vision Care Institute. Angharad has been a PhD student representative for the department of Optometry at City, University of London since 2015. In January 2017 was elected to the College of Optometrists Council as a representative for the South East of England region. Taylor, D.J., Hobby, A.E., Binns, A.M. and Crabb, D.P. (2016). How does age-related macular degeneration affect real-world visual ability and quality of life? A systematic review. BMJ Open, 6(12). doi:10.1136/bmjopen-2016-011504 .